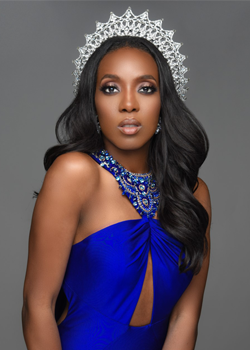 Miss United States 2018 is Andromeda Peters. Andromeda touts a Master’s Degree in Social Work and Bachelor’s in Psychology with a minor in Theatre. No stranger to the stage, she became active in theatre at age 11 and remains passionate about writing, acting, and singing today. This penchant for the arts gave way to her interest in modeling and is signed with MMG NYC. Outside of the industry, Andromeda also works as a psychotherapist with a concentration in mindfulness and her very own self-love curriculum. As a therapist, Andromeda was led to her platform which is her movement Your Mind Matters where she teaches others that mental health is just as important as physical health. Andromeda runs workshops for women and teaches them self-care tips and provides mental health resources, as well as safety tips taught female police officers so that women feel empowered. She also teaches students the signs on when and how to seek help for themselves and others, and mindfulness techniques such as meditation. Andromeda’s passion lays in letting our country know that asking for help makes you brave.